Don't turn your nose to Fido's or Fluffy's bad breath! For pet owners, taking an active role in keeping your pet’s teeth and gums healthy is extremely important as studies have shown that 80 per cent of dogs over three years of age show signs of oral or dental disease. While pets do not suffer from cavities the same way we do, they can suffer from gum disease and periodontal disease, which can have long reaching side effects on the rest of their health. Raising the awareness of the importance of good dental health in pets, and how to care for your pet’s teeth, has been the mission behind Pet Dental Health Month this August. And with only one week left to go, the team here at VetShopAustralia would like to take this opportunity to provide all pet owners with some tips from the RSPCA; on how you can take a more active role in your pets dental health, ensuring your best furry friends keep on smiling! 1. Oral disease in pets starts with a build up of bacteria that can cause plaque. As a bacterium grows in the plaque, the plaque turns to tartar. 2. An appropriate diet designed to remove plaque and tartar or to prevent the formation of tartar should be part of your pet’s dental health plan. 3. Common signs of periodontal disease can include bad breath, painful mouth, difficulty eating or reduced appetite, teeth loss, pawing and rubbing of the mouth, bleeding gums, yellow or brown tartar build up on teeth and increased drooling or dribbling. 4. If left untreated, periodontitis can lead to tooth loss and can cause damage to other organs, such as the heart, liver and kidneys, or lead to other serious health problems. 5. 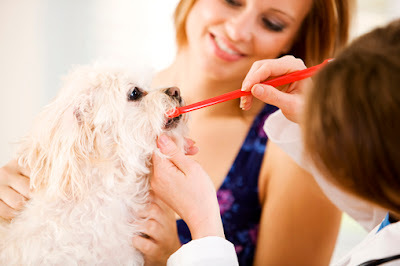 All pets should have a regular dental check-up and teeth scaling if required.